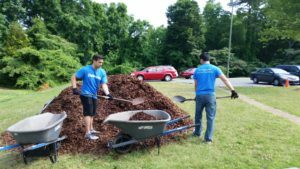 Deloitte is committed to supporting its local communities year-round, but for one day each June, that philanthropic commitment takes outsized priority. Nationwide, the organization takes the day to volunteer. Pencils are put down, out-of-office emails are set, and personnel from the CEO on down pitch in on local service projects for Impact Day. Deloitte has a relationship with the United Way both nationally, as well as in local communities where professionals live and work. As with organizations that have national reach with local roots, each United Way chapter supports the same high level goals, but in a way that helps address critical causes in the local area. The United Way presents an opportunity for people to get involved in their communities even after relocating. For example, when Eileen moved from Atlanta to Charlotte, she was able to work with the local Charlotte chapter of the United Way and learn more about her new community. 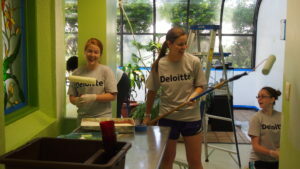 Giving back is a business imperative for Deloitte, and also can give the organization a competitive advantage when attracting and retaining new talent. Specifically, Deloitte’s 2016 Millennial Survey found that Millennials are looking to work for an organization that puts purpose before profit. Many non-Millennials share this belief too. 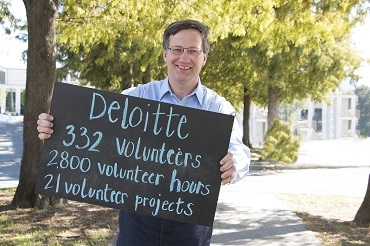 Deloitte’s relationship with nonprofit organizations, and initiatives, like Impact Day, provide Deloitte’s people with the opportunity to give back to their local communities. Likewise, Eileen told us that hearing from United Way’s chief impact officer Laura Clark at a Women United event was also instrumental. The opportunity to help grow Women United has Eileen and many of her peers “fired up and excited” about making a powerful impact. “When you hear from someone out on the front lines, like Laura shared with us, that brings the community need to life in a very encouraging way,” she said.